Great conditions on the 29th, very calm and overcast and it just felt promising out in the field; it was however just a feeling! The overdue first Green Sandpiper of the year was the highlight on Kirbest scrape along with other wader counts including 162 Knot, 141 Sanderling, 3 Bar-tailed Godwits, a Whimbrel and 223 Turnstone while the lone Barnacle Goose was wandering around the north end and 3 Red-throated Divers and 5 Great-northern Divers were counted on the flat seas. A light easterly on the 30th brought some fog and drizzle for a time before the wind switched to the west and picked up into a rough force 6; a few more odd waders appeared as the bulk of the commoner species started to disperse with a ‘grey’ Curlew Sandpiper and a full summer Little Stint on Gretchen while a single Golden Plover and 8 Purple Sandpipers were leftover. A handful of migrants were seen through the day including a Woodpigeon, 3 Collared Doves, a Sand Martin, single Chiffchaff and Willow Warbler, a Spotted Flycatcher and a Siskin while the Barnacle Goose remained and the Black-throated Diver and a Little Tern popped up again in Nouster. 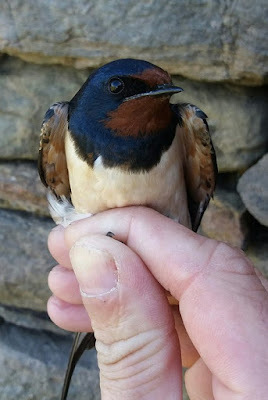 Another fine, sunny day with an increasing SE breeze on the 27th led to all the quality birds being along the more sheltered west coast; the highlight was a Common Nightingale in sheep punds at the north end of Torness – it was a tricky bird in the field as views had suggested a Sprosser but as the Obs staff assembled, a net was erected and the bird easily caught to reveal it was the rarer (on here anyway!) 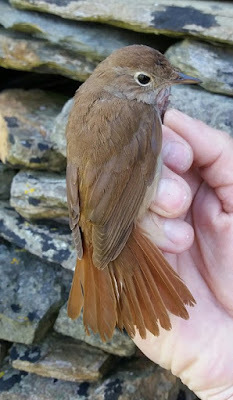 Nightingale, only the 6th record for the island. Also along the west coast were a female Bluethroat and an extremely late Woodcock while elsewhere a Sparrowhawk, 6 Woodpigeons, 4 Collared Doves, 3 Sand Martins, 2 House Martins, a Chiffchaff and a Pied Flycatcher were the other migrants of note. A different day on the 28th with overcast skies and a brisk westerly wind; a Hobby which flew south through the northern census area was the first for the year while another wave of waders included and excellent count of 370 Knot with over 300 at Westness alone but it was interesting to note that the high numbers comprised mainly grey plumaged birds with the high numbers of sparkling, bright red birds already passed through. 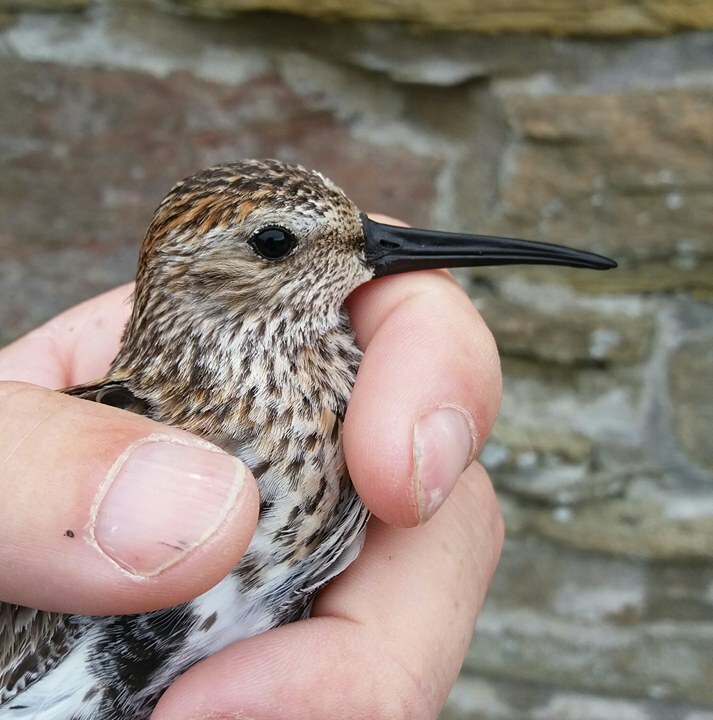 Other wader counts included 221 Sanderling, 103 Dunlin and 317 Turnstone. 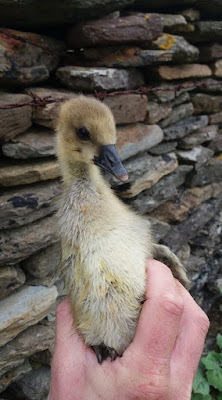 A late Barnacle Goose was wandering around Bewan with other migrants including a Sparrowhawk, 3 Woodpigeon, 2 Collared Doves, a Short-eared Owl, a Sand Martin, 3 House Martins, single Garden Warbler, Blackcap and Spotted Flycatcher, 2 Chiffchaffs and the lingering Chaffinch in full song at Holland. It was a good day for other wildlife as well with a Minke Whale seen heading south off The Lurn and a beautiful Hummingbird Hawkmoth seen along the coast at Quoybanks which, when combined with a little influx of Silver Y’s provides a good sign of more southern goodies to come! A nice day on the 25th, warm and sunny with light winds started brilliantly with a seawatch off The Lurn, near the Obs producing a fine drake Surf Scoter flying south, close inshore with two Common Scoter – the first record for the island since 2008! Two Manx Shearwaters were also offshore before the rest of the day was again dominated by wader numbers which continue to remain high (shouldn’t be long before they start to disperse) as counts included 310 Ringed Plover, 80 Knot, 427 Sanderling, 152 Dunlin, 6 Whimbrel, 734 Turnstone and a single Curlew Sandpiper still. Other new arrivals were slow with a Grey Wagtail at Westness the pick, along with a Kestrel, a Short-eared Owl, 7 Sand Martins, 11 House Martins, 2 Tree Pipits and single Blackcap, Chiffchaff and Spotted Flycatcher. The stunning 26th also started brilliantly with a pod of 3 ORCAS feeding (just mooching around really!) in Nouster before they drifted off out towards Sanday; the day’s other highlight came late morning with a smart female Honey Buzzard seen drifting up the west coast before seemingly heading away north but it bottled out of the sea crossing ahead of her and drifted back in allowing the rest of the staff to get fantastic views as it perched on rocks near Westness. It was a similar day to yesterday after this with the exception of the first 2 Little Terns of the year briefly in Nouster; the Curlew Sandpiper was still present with a reduced number of other waders while other birds included a Sparrowhawk, single Woodpigeon and Collared Dove, 9 Sand Martins, 5 House Martins, 2 Blackcap, 4 Chiffchaff and a Spotted Flycatcher. Nice and sunny with a fresh westerly breeze but it was hard work out in the field as it seemed that few new birds were out there to be found; all that changed in the space of ten minutes late afternoon though when first a lovely female Red-necked Phalarope appeared on Gretchen Loch and then, shortly afterwards, a cracking diminutive Temminck’s Stint dropped in to land on the same loch! 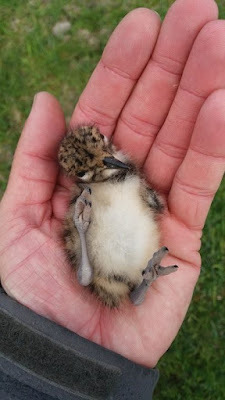 The Stint is not surprisingly much rarer than the Phalarope with only nine previous records. A full summer plumaged Ruff also appeared on Hooking while other waders were still present in high numbers including 60 Knot, 223 Sanderling, 26 Purple Sandpipers, 105 Dunlin, 2 Whimbrel and 426 Turnstone. The Black-throated Diver was still in Nouster along with 4 Great-northern Divers and 3 Red-throated Divers while a Common Tern was noted amongst 858 Arctic Terns who are busy displaying and setting up territories and 19 Lesser Black-backed Gulls in a recently ploughed field was the year’s high count so far. Landbirds were quieter as migrants comprised 2 Woodpigeons, a Collared Dove, a Short-eared Owl, 12 House Martins, 10 singing Sedge Warblers, 2 Garden Warblers, 2 Blackcaps, 6 Chiffchaff and 2 Spotted Flycatchers. A slower day on the 24th with mist and murk coming and going throughout the day; waders showed some slight increases including 298 Sanderling, 40 Purple Sandpipers, 118 Dunlin, 102 Knot, 700 Turnstone and the Ruff still with the Black-throated Diver still present among 24 Great-northern Divers and 9 Red-throated Divers counted on flat calm seas. 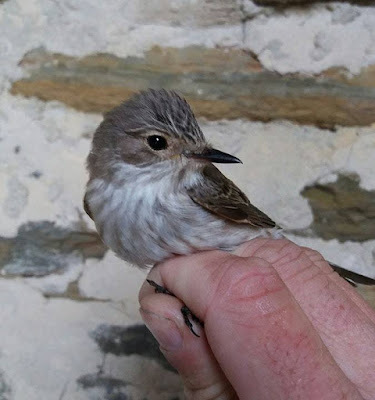 Other birds included a Collared Dove, a Short-eared Owl, 6 Sand Martin, 9 House Martins, 11 Sedge Warblers, a Reed Warbler trapped at Holland, a Blackcap, 3 Chiffchaff, 3 Spotted Flycatchers and a lingering Chaffinch. There are also many goslings running around now and inevitably some of them get separated and have to be gently guided back towards their parents! A stunning day with wall to wall sunshine and a warm southerly breeze, it was an excellent day in the field with a succession of highlights, getting folks chasing around all over the place, running after birds and cetaceans with varying degrees of success! The highlight for many was an awesome pod of 6 ORCAS which spent a good hour mooching off the north end of the island; the group, which contained a large bull, two young males and three smaller animals was last seen heading south off the east coast towards Sanday and were different to another group seen off Papa Westray shortly afterwards. The selection of avian highlights was headed by a brief Little Egret which flew up the east coast and out towards Fair Isle to the north – an excellent bird for the island being only the third record! Other good birds included an immature White-tailed Eagle which came in off the sea at Westbeach and continued north, a Marsh Harrier which came in off the sea at Brides and also went north, a 1st summer Little Gull on Gretchen and a Quail flushed from Waterhouse. The Curlew Sandpiper was again at Westness with a good selection of other waders including 120 Ringed Plover, 105 Knot, 156 Sanderling, 68 Dunlin, 6 Whimbrel, 562 Turnstone and a rapidly reducing 13 Purple Sandpipers. Landbirds were also well represented as totals comprised 3 Sparrowhawks, a Woodpigeon, a little influx of hirundines with 8 Sand Martins, 12 House Martins and 90 Swallows, a Black Redstart, 11 Sedge Warblers (with good numbers setting up territories), a Garden Warbler, 3 Blackcaps, 7 Chiffchaff, 3 Willow Warblers, 2 Spotted Flycatchers, 2 Pied Flycatchers, 2 Jackdaws south over Holland, a Chaffinch and 3 Mealy Redpolls. 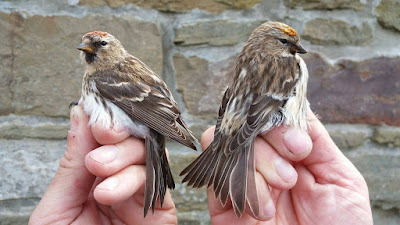 The 22nd felt really good with an increasing south-easterly breeze and building cloud after a sunny morning with a female type Common Rosefinch near the lighthouse the start but also unfortunately the end of the day’s highlights; a Garden Warbler trapped at the Obs and a Whimbrel on the coast are the only other things I can think to mention! 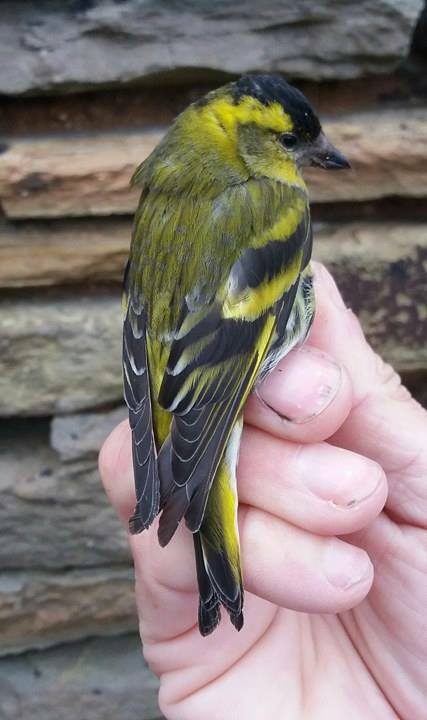 Landbirds were a bit slow with a Grey Wagtail at Brides and 4 Mealy Redpolls the pick along with a Woodpigeon, 6 Sand Martins, 3 House Martins, 8 Sedge Warblers (with many of the breeding birds back on territory now) and single Garden Warbler, Chiffchaff and Pied Flycatcher. A miserable morning on the 20th with persistent, heavy rain and a cold, strong NE wind kept most people indoors but it slightly improved in the afternoon (i.e. the rain became lighter) allowing some decent new birds to be unearthed, highlighted by a female Bluethroat out on the point at Trinley, the first Curlew Sandpiper of the year on the beach at Westness in amongst the big wader flocks still present – which included a year’s high count of 105 Knot, a new drake Garganey which joined the long staying pair and now at least 6 Mealy Redpolls milling about. Other birds included 5 Great-northern Divers, 3 Herons, single Woodpigeon and Collared Dove, 6 Sand Martins, 8 House Martins, a Willow Warbler, a Black Redstart which got stuck in the tractor shed, a White Wagtail, 3 Sedge Warblers, 4 Chiffchaffs, 3 Willow Warblers, 4 Spotted Flycatchers, a Pied Flycatcher and a late Chaffinch. Wall to wall sunshine with a decreasing southerly wind on the 17th and with it tipped to be a good raptor day it was no real surprise that at least 2 Marsh Harriers were seen across the island with one seen heading high north towards Fair Isle and the other seen at several spots through the day. The day’s other highlight was the first Quail of the year which was seen flying past Holland towards the airstrip. 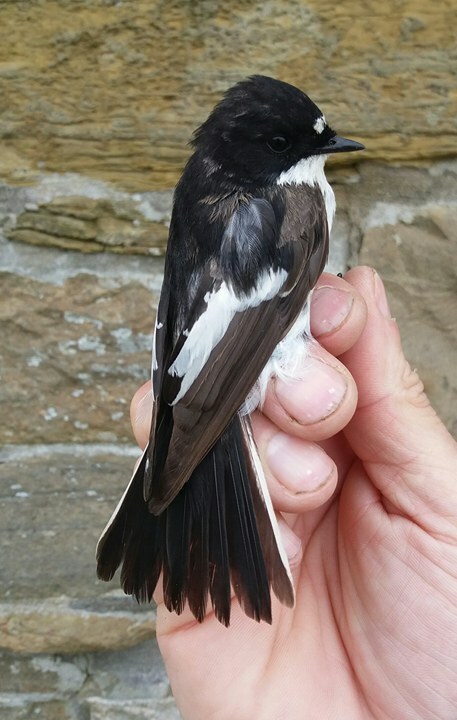 There were limited other new arrivals as migrant totals included a big pale, sandy 1st winter female Peregrine, 2 Woodpigeons, 5 Collared Doves, a Sand Martin, 2 House Martins, 2 Song Thrush, a lingering Redwing, single Whitethroat, Blackcap and Chiffchaff, 4 Willow Warblers, a Pied Flycatcher, only the second Jackdaw of the year and 3 Mealy Redpolls. A good arrival of 780+ Arctic Terns were mainly around the north end of the island while waders were still prominent with 180 Sanderling, 113 Purple Sandpipers, 60 Dunlin, a Whimbrel and 461 Turnstone counted. The 18th was another awesome day warm, sunny with light NE winds but all in all a quiet day for migrants as the only real new birds noted were a little influx of at least 7 singing Sedge Warblers in funny places and the first Reed Warbler of the year. Other counts included 2 Woodpigeons, a Sand Martin, 4 Chiffchaffs and 2 Pied Flycatchers while 3 Red-throated Divers and 9 Great-northern Divers were counted on calm seas. 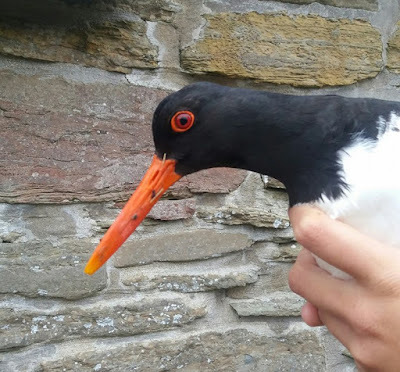 Until another angry (d**k) Oystercatcher decided he was exploring too far and knocked him off the wall! Still promising conditions on the 15th with a brisk easterly wind and plenty of cloud but I suppose the biggest news was the absence of the infamous Red-winged Blackbird; searched for several times on both days in her usual haunts there was no sign of the streaky, spotty crowd puller! It was a bit of a quiet day all round really with the first Swift of the year along the west coast and the (yet again) surprise reappearance of the Gretchen Green-winged Teal – last seen on 26th April but realistically it is equally likely to be a new passage bird as it is the returning, wandering individual? Other migrant totals included 2 Sparrowhawks, 2 Woodpigeons, 4 Collared Doves, a Short-eared Owl, 4 House Martins, single Tree Pipit, Robin, Whinchat and Sedge Warbler, 4 Lesser Whitethroats, 2 Garden Warblers, a Blackcap, 8 Chiffchaff, 4 Willow Warblers and one each of Spotted and Pied Flycatchers. The wind was back in the SW on the 16th and increased steadily through the day to become a raging force 6-7 by the evening; the day’s highlights consisted of the first Cuckoo of the year behind the surgery and a Marsh Harrier which toured around the island. Other migrants showed a slight increase as totals included 3 Sparrowhawks, 2 Woodpigeons, 8 Collared Doves, a Short-eared Owl, 91 Swallows, 6 House Martins, a Whinchat, a Song Thrush, 2 Sedge Warblers, 4 Lesser Whitethroats, single Garden Warbler and Blackcap, 6 Chiffchaff, 5 Willow Warblers, 2 Spotted Flycatchers, a late Chaffinch, 3 Mealy Redpolls and 10 Carrion Crows. The 13th was the kind of spring (or indeed autumn) day that you pray for, being misty and murky with drizzle and fog drifting in and out on a brisk easterly wind; it started off pretty well with a smart female Bluethroat along the Obs track but although there was a nice array of migrants across the island through the day this proved to be the highlight! Other migrants including the first 3 Pied Flycatchers of the year, 3 Sparrowhawks, a Kestrel, a Greenshank, a Short-eared Owl, a female Yellow Wagtail (probably a flava), 6 White Wagtails, single Redstart and Whinchat, 65 Wheatears, a Ring Ouzel, a Stonechat (unusual this late in the spring), a single lingering Redwing, a Sedge Warbler, 3 Lesser Whitethroats, 4 Whitethroats, a Blackcap, 10 Chiffchaffs, 8 Willow Warblers, 3 Spotted Flycatchers and 3 Siskins. 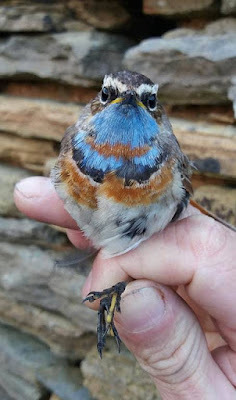 The following day was also heaving with potential as we kept the light easterly breeze and some spells of murk and drizzle before the wind swung round to the SW producing a gorgeous sunny afternoon; two more Bluethroats were again the highlight with a singing male at Sangar and another male at the old Kirk in the afternoon which was later trapped. There was a general increase in migrant numbers across the island as totals included 2 Sparrowhawks, 2 Kestrels, 3 Short-eared Owls, 4 Tree Pipits, a steady passage of 120 Swallows and 6 House Martins, 3 Robins, a Black Redstart, 3 Redstarts, a Whinchat, 80 Wheatears, 2 Ring Ouzels, the Redwing still, 2 Sedge Warblers, 9 Lesser Whitethroats, 4 Whitethroats, 9 Blackcaps, 12 Chiffchaff, 16 Willow Warblers, 8 Spotted Flycatchers, a Pied Flycatcher, 2 lingering Brambling, 4 Siskin, 2 Mealy Redpolls, the Stonechat still and 2 Goldfinches while a notable Corvid passage of 36 Carrion Crows, 20 Hooded Crows and a few hybrids made all the breeding waders very nervous. Waders were still obvious, scattered all round the coast including a year’s high count of 237 Ringed Plovers, 3 Great-northern Divers were offshore, the drake Garganey was still on Hooking and last but not least the Red-winged Blackbird remained faithful to her Garso gas bottles. Brisk easterly winds and spitting rain first thing led to a promising day with the highlight being excellent numbers of stunning waders passing though the island, forming huge flocks feeding on big piles of seaweed; the first Little Stint of the year was on Trolla but it was the numbers of commoner species that were noteworthy with 1,167 Turnstone representing a new island record count along with 75 Knot, 134 Sanderling, 227 Purple Sandpipers, 168 Dunlin, 10 Bar-tailed Godwits and 3 Whimbrel. Landbirds were quieter although the first Spotted Flycatcher of the year pitched up late in the afternoon; other migrants included the Red-winged Blackbird (still, again, both days, will it ever leave…), 4 Sparrowhawks, a White Wagtail, a Lesser Whitethroat, 2 Blackcap, 4 Chiffchaff, 4 Willow Warblers, 2 Bramblings, a Goldfinch and 2 Common Redpolls. Three Whooper Swans and 5 Pink-footed Geese reminded us of colder times in the not-so distant past. Bright and sunny the following day with a pretty strong easterly wind making things tricky in the field; waders again dominated with counts of 144 Ringed Plovers, 55 Knot, 161 Sanderling, 246 Purple Sandpipers, 135 Dunlin, 2 Common Sandpipers and 832 Turnstone while an increased 316 Arctic Terns began prospecting around the isle. Other migrants showed some slight increases in the favourable conditions as totals comprised single Sparrowhawk, Kestrel and Short-eared Owl, an influx of hirundines with 142 Swallows, 4 Sand Martins and 3 House Martins, 2 Lesser Whitethroat, a Redstart, a Whitethroat, 3 Blackcaps, 7 Chiffchaff, 3 Willow Warblers, the Spotted Flycatcher, 2 Brambling, a Common Redpoll and 2 Goldfinches. The wind had switched back round to the west on the 9th after a long spell of easterlies and apart from being a bit chilly it was a pleasant day; the Red-winged Blackbird remained at Garso (both days) while there were still 2 White-billed Divers off the west coast although at least one may have been a different bird as one flew past the lighthouse at the same time as one was on the sea off Torness where there were also 9 Great-northern Divers, 3 Red-throated Divers, 21 Common Scoter and a steady movement of 400+ Kittiwakes. Waders continued to turnover as counts included 5 Knot, 99 Sanderling, 41 Purple Sandpipers, 59 Dunlin, 17 Black-tailed Godwit (including 10 heading north at sea), 4 Whimbrel, 95 Redshank (including flocks seen heading north), a Common Sandpiper and 227 Turnstone. Landbirds were reduced in numbers with the change in wind direction as totals comprised single Kestrel and Merlin, 2 Redstart, a Song Thrush, 2 Lesser Whitethroats, 2 Blackcap, 5 Chiffchaff, 2 Willow Warblers, a Brambling, 2 Siskin and 4 lingering Snow Buntings. The brisk westerly breeze brought with it waves of drizzle and general murk through the morning of the 10th so expectations were understandably low but that was blown out of the water when Eday’s awesome SNOWY OWL was flushed from the roadside at Ancum from where it flew high and steadily south over Hooking causing chaos where ever it went; unfortunately after it was lost to view over the loch it, despite much searching, was never seen again and presumably carried on straight south towards Sanday. The wind died off to practically nothing by lunchtime for a couple of hours before springing back up from the east and there were a few more landbirds noted on the back of this change including 5 Sparrowhawks, a Short-eared Owl, 5 Sand Martins, 58 Swallows, a late Dunnock, 2 Robins, a Redwing, 4 Lesser Whitethroats, 3 Blackcaps, 3 Chiffchaffs, 3 Willow Warblers, 3 Bramblings, 2 Siskins, a Common and 2 Lesser Redpolls, 12 Carrion Crows and a Goldfinch. A new Black-throated Diver was in Nouster – this time a non-descript first winter bird while waders were again prominent as amongst the big piles of seaweed were 54 Ringed Plovers, 46 Knot, 114 Sanderling, 93 Purple Sandpipers, 101 Dunlin, 5 Bar-tailed Godwits, the first Greenshank of the year, a Common Sandpiper and 440 Turnstone all looking mighty fine in their spangly summer plumages. Overcast and chilly with a brisk and increasing NE wind on the 7th limited new arrivals across the island with most of the migrants recorded consisting of lingering birds from previous days; the Red-winged Blackbird still remained, still looking settled while other migrant totals included single Kestrel and Merlin, a Sand Martin, single Redstart and Ring Ouzel, 3 Song Thrushes, 3 Lesser Whitethroats, a Whitethroat, 2 Blackcap, 5 Chiffchaff, 9 Willow Warblers and single Chaffinch, Siskin and Redpoll sp. The opposite way round for the 8th with an overcast start with a brisk but decreasing N wind and spells of brightness; Red-winged Blackbird aside, the highlight was probably all four species of Diver seen throughout the day with 2 bonny summer plumaged White-billed Divers lingering off Torness in the afternoon, the equally bonny summer plumaged Black-throated Diver again in Nouster along with totals of 11 Great-northern and 3 Red-throated Divers. Waders were also looking fine in their breeding attire, especially the 197 Sanderling along The Links along with 70 Purple Sandpipers, 3 Black-tailed Godwits, 4 Bar-tailed Godwits and 314 Turnstone. A few reminders of winter still remained however with 3 Pink-footed Geese still along with the lonely Whooper Swan and 3 Snow Buntings. Migrant totals showed some signs of a turnover of birds including the spring's third Grey Wagtail, a Kestrel, a Tree Pipit, a Rock Pipit, 2 Robins, single Redstart and Ring Ouzel again, 3 Song Thrushes, 3 Lesser Whitethroats, a Whitethroat, 3 Blackcaps, 6 Chiffchaffs, 13 Willow Warblers, 2 Brambling, a Siskin, a Redpoll sp. and a trickle of Corvid passage including 2 Carrions Crows and some migrant Hooded Crows upsetting the locals.